Brussels sprouts resemble a miniature head of cabbage for a good reason -- they come from the same plant family. Along with Brussels sprouts and cabbage, the cruciferous, or Brassica, family includes broccoli, kale, cauliflower, collard greens, turnips, mustard and bok choy. Cruciferous vegetables are also referred to as cole vegetables. Cruciferous vegetables are high in sulfur-containing compounds called glucosinolates, which account for their somewhat bitter taste when cooked. Although they are related, there are some nutritional differences between Brussels sprouts and cabbage. Brussels sprouts received their name from the capital city of Belgium where they were first cultivated. They are one of the few vegetable crops to originate in northern Europe and were brought to the United States by French settlers. Brussels sprouts have a long growing season, from spring to fall, and fare better growing in a cooler climate. Although similar in taste to cabbage, Brussels sprouts have a denser texture and milder flavor. Brussels sprouts eaten raw are very bitter, so they are best served blanched, steamed or boiled. A 1/2 cup serving of cooked Brussels sprouts contains 28 calories. There is no fat or cholesterol in this size serving and only 16 mg of sodium. One serving has 6 g of carbohydrates with 1 g of sugar and 2 g of dietary fiber. A 1/2 cup serving provides 2 g of protein, along with other beneficial nutrients, including 604 IU of vitamin A, 47 micrograms of folic acid, 48 mg of vitamin C, 109 micrograms of vitamin K and 247 mg of potassium. One serving of Brussels sprouts also has a small amount of magnesium, phosphorus and calcium. Cabbages have been a staple of the human diet for a long time, being one of the oldest recorded vegetables. There are close to 100 of varieties of cabbage grown worldwide, but the most popular in the United States are savoy, green and red cabbage. The head of the cabbage differs by variety; it can be rounded, flattened or pointed. 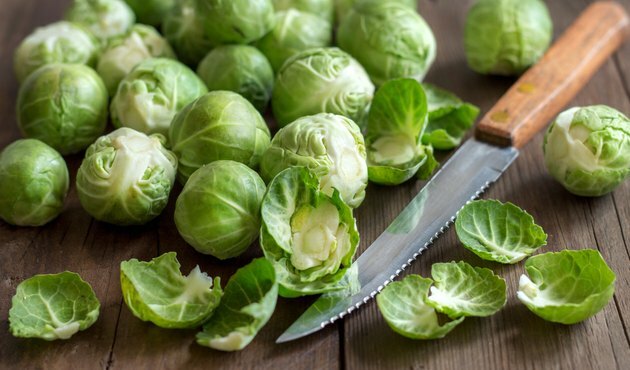 Along with Brussels sprouts, cabbage does best in a cooler climate, but they are ready for picking sooner -- 50 to 60 days, as opposed to 85 to 110 days for Brussels sprouts. There are 17 calories in a 1/2 cup serving of cooked cabbage, about half the amount in the same size serving of Brussels sprouts. A serving of cabbage has no fat or cholesterol and provides only 6 mg of sodium. A 1/2 cup serving of cooked cabbage contains 4 g of carbohydrates with 2 g sugar and 1 g of dietary fiber, along with 1 g of protein. Cabbage also has lower amounts of other nutrients than Brussels sprouts with 28 mg of vitamin C, 3 IU of vitamin A, 60 IU of vitamin K and 22 micrograms of folic acid in 1/2 cup. One serving of cooked cabbage has more calcium with 36 mg, and but less magnesium, phosphorus and potassium than Brussels sprouts. Is Cabbage High in Carbohydrates?